Aura Particulate Respirator offers revolutionary comfort and convenience so it's ideally suited for hotdusty work settings that require long periods of wear. 3M Cool Flow Valve helps provide comfortable, reliable worker respiratory protection. The design of the N95 approved respirator directs exhaled air away from the nose panel, helping reduce eyewear fogging. Comfortable braided headbands help keep respirator securely in place and minimize pulling of hair. Curved low profile conforms well to nose and eye contours, allowing more room for eyewear. Adjustable nose clip helps provide a custom secure seal. Individual packaging and flat fold design provide convenient storage and portability. 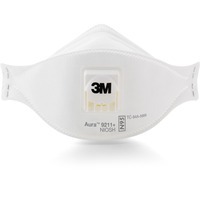 Three panel, disposable respirator also features soft inner material for added comfort.